Texans love St. Patrick's Day. Across the state, revelers gather in pubs and attend their city's parades and festivals to celebrate the Irish religious holiday, all the while adorned in every shade of green imaginable so no one dares pinch them for not following tradition. Although Texas doesn't have the largest contingency of Irish nationals, the Roman Catholics, and Christians, as well as Irish-Americans, maintain many of the traditions of this celebration of Christianity coming to Ireland. While not a legal holiday in the United States, the annual traditions of St. Patrick's Day are still widely observed throughout Texas and the U.S since the late 1700s. Whether you're visiting the Lone Star State or are a resident of the great state of Texas, you'll be sure to find something to do this St. Patrick's Day. Explore the following list and check out these great festivals, pubs, and parades near you. Boasting itself as the "home of the official St. Patrick's Day celebration of Texas," the city of Shamrock hosts an event that gets bigger each year—what else would you expect from a town called Shamrock! By the early 2000s, the annual Shamrock Festival had grown into a two-day event featuring a parade, motorcycle rally, beauty pageants (Miss Irish Rose and Lad n' Lassie), craft shows, a carnival, and a whole lineup of great local and international Irish-inspired music artists. 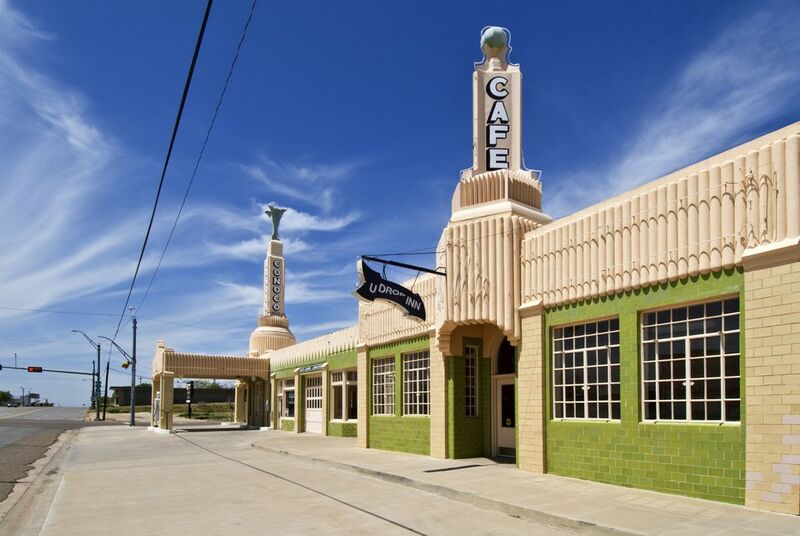 Located along historic Route 66, the town of Shamrock's annual tradition has been a staple of Texas for nearly 70 years, drawing crowds from all across the southern U.S. to join in the festivities. While it may not be the largest event in America, the Shamrock St. Patrick's Day Festival is certainly the largest of its kind in Texas, so if you're in the Texas Panhandle in mid-March, definitely check this celebration out. Since 1990, McGonigel's Mucky Duck has served as Houston's premier Irish Pub, offering live music, traditional food, and great drink in a uniquely Celtic atmosphere. Every year on St. Patrick's Day, McGonigel's hosts a traditional Irish or Celtic artist and serves up their famous fish and chips, beef Guinness, shepherd's pie, and corned beef and cabbage all day, so visitors can get a taste of Ireland while celebrating the holiday and listening to some great tunes. USA Today once called McGonigel's one of the top 10 places in the United States to celebrate St. Patrick's Day, and the makers of Guinness awarded the company the St. James Gate Perfect Pint Certification, so you certainly can't go wrong stopping by this great pub on the holiday. However, you should purchase tickets to the live music show ahead of time as it often sells out, especially for St. Patrick's Day. If you are unable to get tickets, we also recommend Brian O'Neill's Traditional Irish Pub as an alternative. While you're in Houston checking out McGonigel's or Brian O'Neill's pubs, you might as well also visit the 60th annual St. Patrick's Day parade in the downtown area, starting at the Clock Tower at MinuteMade Park on Texas Avenue and moving westbound. The parade is a two-hour free event, open to the general public and appropriate for all ages. Historically, the Houston parade has been one of the largest in the United States and features over 100 floats, dance troupes, and organizations marching in the procession. Be sure to check out the official parade website for up-to-date information about the Grand Marshall, parade start time, and parade routes. The parade will be held on Saturday, March 16, 2019. Over the last decade, O'Malley's Stage Door Pub has become a favorite gathering place among Galveston Island visitors and residents, offering over 100 different beers, a full-service deli, and a comfortable atmosphere perfect for St. Patrick's Day celebrations. Here, you can grab one of the best Ruben sandwiches on the island, sample some traditional Irish pub foods, or, on St. Patrick's Day, the Guinness rep oftentimes visits and hands out free pints of Ireland's biggest beer company. This spot is highly popular among locals, so if you're looking for a more local vibe for your holiday celebrations, O'Malley's is the perfect place to spend your St. Patrick's Day evening with friends. Dallas' only full-service Irish pub, Trinity Hall has live music, a menu full of Irish dishes and, of course, plenty of brews. Great for catching a soccer match during the regular year, Trinity Hall turns into a full-on Irish celebration on St. Patrick's Day. This Mockingbird Station pub actually features a full week of festivities for the Irish holiday, starting in 2019 with a traditional Ceili Dance, continuing with a St. Patrick's Eve celebration, Mass at Dallas' Cathedral Shrine of the Virgin of Guadalupe, and a full schedule of St. Patrick's Day at the pub, parade-related events, and a Sunday Funday wrap-up party. Unfortunately, due to the volume of people expected at Trinity Hall each year, the bar food and drink menus are limited to the top favorites during St. Patrick's Day week, so if you want to explore the full menu of this great Irish establishment, you'll want to revisit after the holiday week. If you find Trinity Hall too crowded, head to Poor David's Pub. While you're in Dallas, be sure to check out the annual St. Patrick's Day Parade and Festival, which will be celebrating its 40th anniversary in 2019. This parade boasts itself as the "Largest St. Patrick's Parade in the Southwest," and with more than 125,000 in attendance, 90+ float entries, more than 1,7000 participants, and 10 or more hours of on-site activations by sponsors over the two-mile parade route, you're certain to find a fun-packed day visiting the parade. When you get tired of being out and about in the hustle, be sure to stop into one of Dallas' Irish establishments to grab a bite or a quick drink. Located in Austin's 6th Street Entertainment District, BD Riley's Irish Pub offers a menu full of Irish staples, plenty of draft beer, sports on 42" plasma screen TVs, WiFi connection, live entertainment, and more. If that doesn't work for you, you can also check out Fado's Irish Pub, which has all the essentials of a great Irish night—good food, excellent beer, sports matches on the television, and live entertainment—making it one of Austin's most popular nightspots year-round. Hosted by the Celtic Cultural Center of Texas, Austin Celtic Association, and Cultural Arts Division for the City of Austin, the annual St. Patrick's Day celebrations in Texas' capital are by far the most traditional of the Lone Star State's festivals and parades. With no green beer—just high-quality Irish brews—and a plethora of traditional Celtic performers and artists, the Austin St. Patrick's Day Festival offers a real look inside and celebration of the culture of Ireland as it relates to the holiday. However, the festival is not free to attend and tickets must be purchased beforehand to enjoy one of the many stages, activities, or events taking place during the celebration.